Anthony Scaramucci, President Trump’s new communications director, was not a fan of HB2, the sweeping anti-LGBTQ law passed by the General Assembly last year. Scaramucci tweeted his disapproval on March 23, 2016, the day that the Republican majorities in the House and Senate met in a one-day special session to approve the discriminatory law in response to a local anti-discrimination ordinance passed by the Charlotte City Council. Wonder if Scaramucci will stand up for LGBTQ folks in his new role as a top adviser to President Trump? Trump recently announced a ban on transgender people serving in the military which, like HB2 itself, is also shameful. President Trump’s announcement on Twitter Wednesday that he would ban transgender people from serving in the military not only caught the Pentagon and Congressional leaders completely off guard, it prompted criticism from Democrats and Republicans alike. Senator John McCain, who earlier this week Trump called brave for returning to Washington to vote on health care despite being recently diagnosed with brain cancer, said he was worried about the effect of Trump’s ban on transgender soldiers currently serving. We should all be guided by the principle that any American who wants to serve our country and is able to meet the standards should have the opportunity to do so — and should be treated as the patriots they are. Good for McCain. 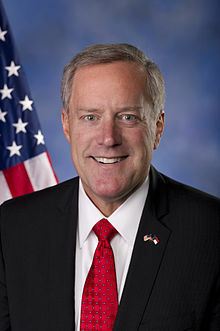 And it turns that North Carolina Congressman Mark Meadows played a significant role in Trump’s decision to discriminate against transgender men and women. Here is part of the account in Axios. In May, the Conservative Action Project released a memo calling for Trump to end the “social engineering” of permitting transgender people to serve and paying for gender re-assignment surgeries. Influential movement leaders wondered what the heck was taking so long, why Defense Secretary James Mattis seemed to be stalling rather than reversing the Obama-era policies. After an amendment to reverse those policies failed, House conservatives, especially Rep. Mark Meadows of the House Freedom Caucus, started threatening not to vote for the military appropriations bill unless the transgender issues were resolved. That’s an odd position for someone in charge of something called the “Freedom Caucus” when you think about it, demanding discrimination against a group of Americans who want to serve their country. But that’s exactly what Meadows is doing, as he stands in the way of progress and demeans the office he holds. Most of the voting rights news lately has not been very encouraging. State legislative leaders are promising to bring up another photo ID bill in one of the series of special legislative sessions likely to be held this summer and fall. Things are even scarier in Washington, where President Trump’s absurd election commission held its first meeting this week with its vice-chairman Kris Kobach from Kansas refusing to admit that Hillary Clinton won the popular vote in the 2016 election. 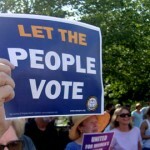 But some states are not playing the dangerous voter suppression game. In fact, the Governor of Rhode Island this week signed legislation that automatically registers people to vote when they are getting a driver’s license or renewing one, unless they choose to opt out. Steve Benen over at the Rachel Maddow Blog points out that the signature means nine states now have automatic registration and Illinois will soon become the 10th. Not too long ago there was a consensus that the more people who participated in the Democratic process the better. The folks on the Right don’t think so anymore. Sadly, now their goal is to keep putting barriers to voting in front of people who are not likely to support them. Republican legislative leaders continue to scramble to distract attention from the fact that the U.S Supreme Court, with a Republican majority that includes President Trump’s appointee, unanimously ruled that they violated the constitution by racially gerrymandering state legislative districts. Thursday, they not only refused a call by Governor Roy Cooper to convene a special session to draw new districts to replace the ones the court threw out, they feigned outrage that he would suggest it. Never mind that the court ruling means that the General Assembly is conducting business representing districts that violate the constitution or that the voters of the state, and potential candidates, deserve to know what the new districts look like as soon as possible. Legislative leaders instead mounted an all-out rhetorical attack on Gov. Cooper for suggesting that they abide by the court’s ruling and draw new and legal districts. There were dozens of ridiculous claims made, but statements by Senate President Pro Tem Phil Berger and Lt. Gov. Dan Forest were the most absurd. Berger told the Associated Press that he didn’t make the decision lightly to refuse Cooper’s call of a special session and added this gem. We need to be serious about what the Constitution requires. The U.S. Supreme Court says the Constitution requires legislative districts that aren’t racially gerrymandered. Maybe Berger should try that—if he wants to be serious. Meanwhile, Lt. Gov. Dan Forest released a slick video (who paid for that you have to wonder) as part of his ongoing campaign for governor in 2020 because he thought the public “might want to know why” he ruled Cooper’s request for a special session unconstitutional. He ends the well-lit appearance with this deep philosophical thought. Thanks for the reminder. But that’s an odd thing to say about a ruling from the conservative U.S. Supreme Court that Republicans violated the constitution to stay in power with their racial gerrymandering. It might lead some folks to think that it is actually Republicans in North Carolina who are trying to thwart the will of the people at the ballot box by violating the Constitution they have sworn to uphold. The proposal to allow people as young as 18 to carry loaded hidden handguns without the background checks and training that the current permitting system provides passed 2nd reading in the House Wednesday. But the vote was 65-54 with eight Republicans voting against it. That is short of a veto proof majority. Unless a few more Republicans come to their senses soon, the bill will pass its final vote in the House today and head to the Senate, where it’s also expected to receive a warm reception. But Gov. Roy Cooper might be able to stop this madness with a veto if the Republicans who wisely voted against the proposal Wednesday stick to their principles. Becky Ceartas of North Carolinians Against Gun Violence summed up the reasons why that is so important in a statement after the vote. We are incredibly disappointed that lawmakers in Raleigh voted to water down the concealed carry weapons permitting system. 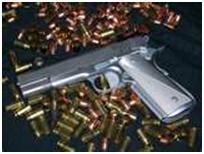 The changes that they made essentially do away with the key components of the concealed carry weapons permitting system. The concealed carry weapons permitting system ensures that 18 year olds cannot buy a gun and requires eight hours of classroom and live fire training. Without these classes, the public cannot be certain that a gun owner is knowledgeable of the rules and laws of carrying a hidden loaded weapon in public.